Six severely injured dogs were seized from a dog-fighting syndicate in Pretoria on Thursday, announced the Society for the Prevention of Cruelty to Animals (SPCA). “Police arrested eight people after the SPCA swooped in on a dog-fighting syndicate in Atteridgeville in the early hours of Thursday,” said spokeswoman Este Kotze. Two dogs were removed from the same location during a raid last Monday, reports Independent OnLine. “The SPCA is in possession of footage that shows a dog used to train other dogs to fight,” Kotze said. “Her mouth was tied with duct tape and she was chained so there was no escape or defense against the dogs which set upon her in frenzied attacks.” She said the footage also showed the dog dying. 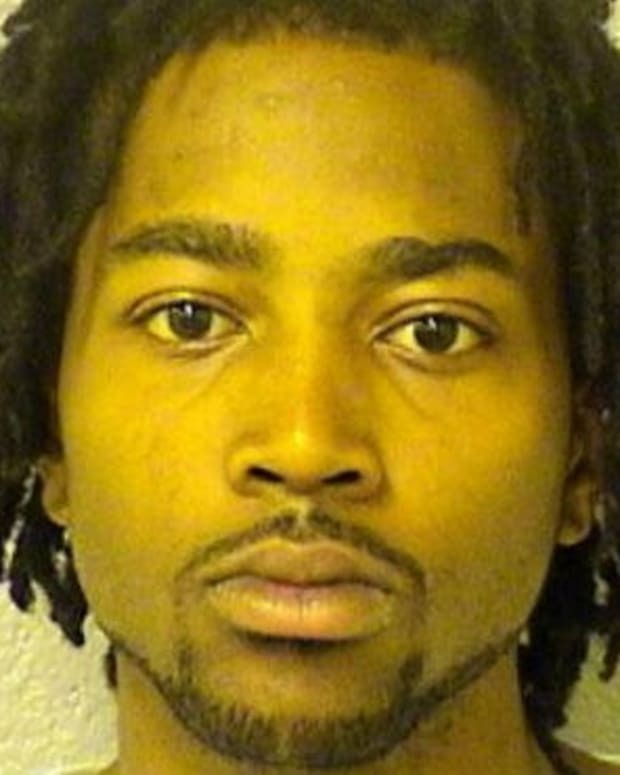 Investigators received the video footage following a tip-off from residents. They then began identifying who was in the footage. Thursday morning’s operation was done with the assistance of the South African Press Association (SAPA), with three houses being raided. Officials said they found the dogs in enclosures where they had been hidden. 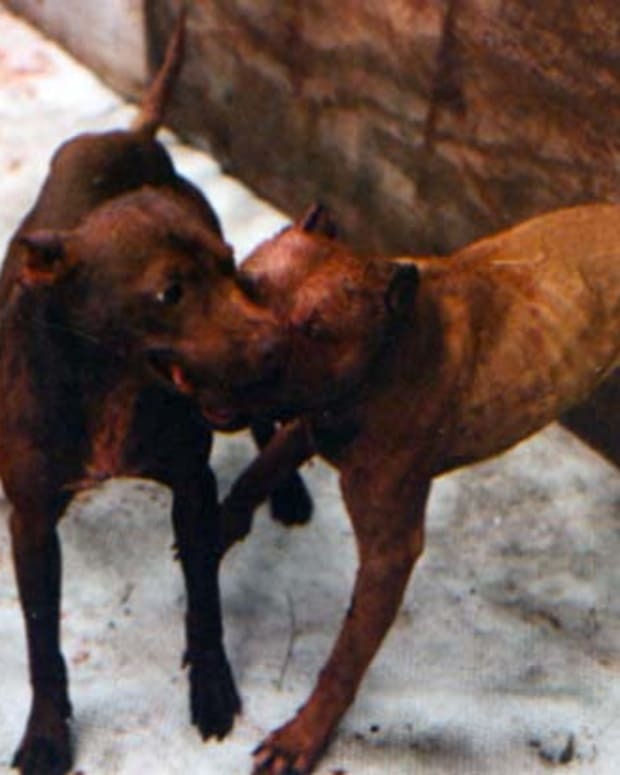 One of the dogs rescued (shown in photo above) is believed to be another bait dog. This dog has severe injuries and will be examined by a vet to see if it can be saved. The other dogs will be assessed by an animal behaviorist to see if they can be rehabilitated, Independent OnLine reports. Kotze said cruelty charges were filed at the Atteridgeville police station in the latest raids. ( Atteridgeville is a township just west of Pretoria.) The eight suspects are to appear in the Atteridgeville Magistrate’s Court soon on charges relating to the Animal Protection Act. In South Africa, as in many countries, there has previously been little attention given by the government to prosecution of crimes against animals. A recent anti-dog fighting campaign has been launched by the National SPCA (NSPCA) because of the unabated prevalence of the brutal “blood sport” all over the country and the immeasurable suffering of the animals. Shaun Smillie of Independent Online has written a heart-wrenching account of a dog called merely “Skinny Dog,” who was a bait dog filmed sadistically on a cell phone as dogs being trained for fighting attacked her. The terror shows in the eyes of the helpless creature whose mouth is duct-taped closed-- the teeth of bait dogs are often filed down or pulled--and she is chained so that she cannot escape the brutal assaults that rip the flesh from her face and tear at vulnerable areas of her body. “Skinny Dog’s” painful final days and hours of life should never be forgotten by any person who cares about animals and ignite renewed passion and dedication to efforts to stop dog fighting everywhere. “ Skinny dog wasn’t meant to have a chance. Her muzzle was taped and a heavy chain prevented her from fleeing the pit bull that kept savaging her. “She appears on video footage, taken on a cell phone, which showed how she attempted in vain to escape the American pit bull that had been set on her. “Days later, she would be dead. 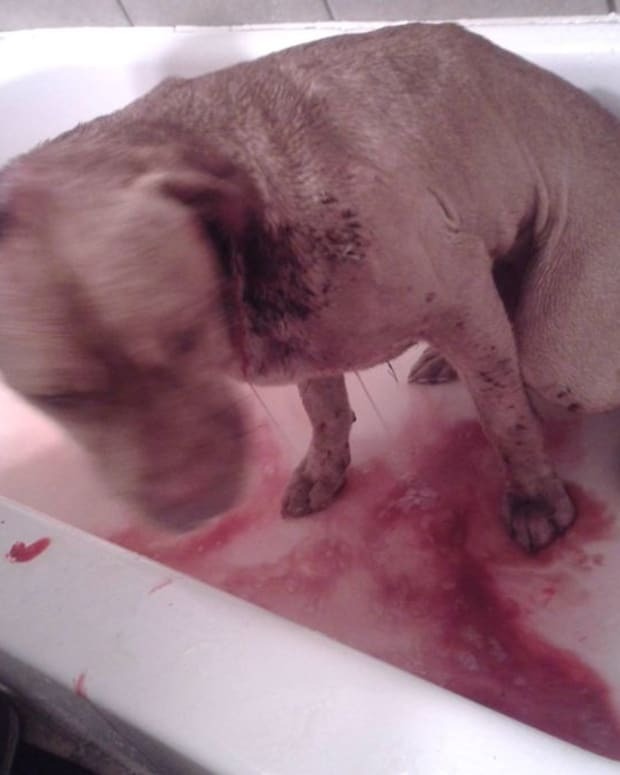 “It was this footage that early on Thursday morning led to the arrest of eight suspects in Atteridgeville, near Pretoria, who are allegedly involved in a dog-fighting syndicate. “What the footage shows is a pit bull released onto the bait dog. The dog grabs Skinny by the face. Every time Skinny attempts to escape, she is pulled back by one of the men holding the chain. “The wounds on her face and ear are extensive. "Eventually, the pit bull is pulled from the bait dog and the film ends. “You can see the absolute terror in her eyes; she knows what is coming,” said NSPCA investigator Wendy Willson. “Animal behaviour practitioner Karin Pienaar has also viewed the footage. “She is restrained in such a manner that she cannot defend herself, run away or even protect her vulnerable body parts,” said Pienaar. Investigators at the NSPCA believe this is the first time that footage involving a bait dog has come into the possession of law-enforcement authorities. The dog received no treatment for her injuries and was later brought out again to be used as bait to “train” another dog to fight. “It is believed that Skinny was used in further dog-baiting sessions and was eventually finished off by a pit bull when the handlers decided she was too badly injured to carry on,” writes Shaun Smillie. Este Kotze of the SPCA said the video shows her dying.